The course in Garland, Texas sees some fast racing thanks to dry conditions. 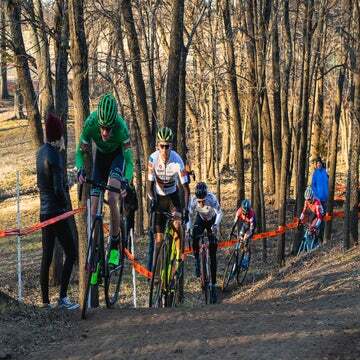 Gage Hecht and Katie Clouse grabbed victories on the second day of racing at the Resolution ’Cross Cup in Garland, Texas. The dry and hard-packed course yielded fast racing in each of the events. Following his win in Saturday’s elite men’s race, Hecht returned on Sunday looking to go perfect on the weekend of ProCX action. By the second lap, six riders had settled in at the front of the field that was comprised of 24 riders. That group included Hecht (Alpha Bicycle Co.-Groove Subaru), Michael van den Ham (Garneau-Easton-Transitions), Andrew “Drew” Dillman (SDG Factory Team), Brannan Fix (Alpha Bicycle Co.-Groove Subaru), Cody Kaiser (LangeTwins-Specialized), and Ben Gomez Villafane (Garneau-Easton-Transitions). The group slowly whittled down under the quick pace, with Hecht and Dillman finding themselves all alone at the front with two laps remaining. From that point, the duel was on. “I knew that he was strong on the straights,” Dillman said. “Right before one to go, I had a little bit of a gap, I saw a little glimmer of hope, I tried to take advantage of it but I looked back by the end of the pavement and he was right there. Hecht finished the nine-lap race in 59:12, 8 seconds faster than Dillman and 32 seconds ahead of third-place Kaiser. Clouse (Alpha Bicycle Co.-Groove Subaru) claimed her first win of the 2018 ProCX season by staying at or near the front of the race throughout and then stopping a pair of attacks with half a lap to go. 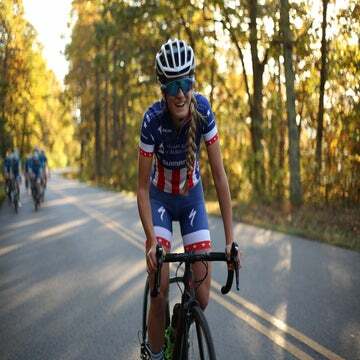 Several groups formed in the field of 23 riders, including the leading foursome of Clouse, Courtenay McFadden (Pivot Maxxis-Stan’s DNA Cycling), Lily Williams (The Pony Shop-KPMG), and Raylyn Nuss (Gateway Harley-Davidson Trek). Clouse and McFadden led the charge for most of the six-lap race until Nuss made a move with one lap remaining. Her effort fell short partially because she came unclipped while pedaling. In the meantime, McFadden — who won Saturday’s race in Garland — tried a move of her own to see if it would stick and lead her to another victory. Clouse, however, quickly shut it down and surged ahead to take the win in 44:01, 8 seconds ahead of McFadden and 16 seconds ahead of Nuss.